Parker Hannifin is a global leader in motion control components and system solutions serving industrial, mobile and automotive markets. Specialising in hydraulics, pneumatics, electromechanics, fluid connection and filtration, the company can act as a single source for all automotive market requirements. Customers rely on Parker’s proven multi-technology systems, engineering excellence, world class manufacturing and customer service to provide comprehensive application solutions and reduce manufacturing time and total cost of ownership. Parker is committed to helping customers become more productive and more profitable through its global offerings of motion and control products and systems. In an increasingly competitive global economy, the company seeks to develop customer relationships through technology partnerships. Working closely with customers, it can ensure the best selection of technologies to suit the needs of their applications. Among the challenges in automotive manufacturing is how to achieve globalisation in order to address growing markets. Another is to improve efficiencies in TAKT time – the rate at which a finished product needs to be completed in order to meet customer demand – in order to increase overall productivity. Parker’s global footprint ensures localised product and service, with more than 300 global factories and 13 000 distribution network locations. Its machine schematic review process ensures that the most efficient systems are provided to customers. Programme management services address a process in order to commonise the products used on a programme and make recommendations for the ongoing management of spare parts inventory. In addition Parker field sales and distribution representatives are present on the plant floor, addressing system diagnostics, product functionality and product lead time to ensure manufacturing productivity. 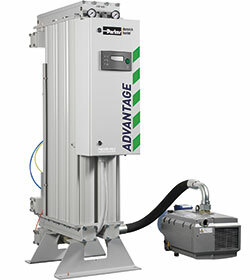 Parker’s actuators and accessories for welding robots prevent water expulsion. Their integrated design allows for dry weld tip changes and keeps water off equipment and out of the production cell. Paired with the Water Saver, the Water Retract Actuator (WRA) prevents weld water expulsion from the robot during tip changes, keeps water off equipment and electronics within the cell, and reduces water consumption costs and the need for expensive chemical additives. There are many benefits to using a Parker Eco Drive system. Designed with closed loop pressure control, it will Increase die casting speed. Piston speed ranges from 0,05 to 10 ms, with a maximum acceleration of 500 m/s, and a pressure increase from 160 to 300 bar in 50 ms.
Transair piping systems were designed to avoid the issues created by traditional systems. Benefits of using Transair include corrosion resistance, immediate pressurisation and provision of clean air, together with a leak-free guarantee. In the compressor room, Parker offers many products to filter and condition dry air before it is distributed throughout the plant. Parker can even carry the controlled air to a customer’s specific requirement through an integrated supply system. The company can assist with most applications across a full range of sizes. Parker filters protect customer equipment, resulting in quality finished products, together with reduced downtime and lower costs. Portable filter carts are the ideal way to pre-filter and transfer fluids into reservoirs or to clean up existing systems. Using a Parker portable filter cart is the most economical way to protect a system from damage caused by contamination. In addition, point of use desiccant dryers are the simplest and most reliable method of ensuring that sensitive pneumatic equipment is not exposed to damaging moisture. With 15 years’ experience in manufacturing the world’s bestselling white light portable particle counter, the CM20, the progression to the LaserCM with its opto-mechanical, continuous wave SPSL single point source laser is both a natural and customer driven development.